What is Rapid Drug Detox? The RDD center is no joke. I detoxed off of 360 mg of methadone. I was on methadone for 8 years. The experience there was wonderful. They take excellent care of you from the time you get there until you leave. The nurse Jesse was a God send for me. The man is incredible, he was there with me whenever I needed him. He helped me through one of the toughest and hardest things I have ever had to go through. This was definitely no walk in the park but I am free from methadone for nine days now. I owe everything to the RDD center, they not only gave me my life back, they treated me as if I was family. If you have any doubts or concerns about this place, please feel free to contact me. I give all my strength to GOD and to the RDD center because if it wasn’t for them, I would still be a methadone junkie. 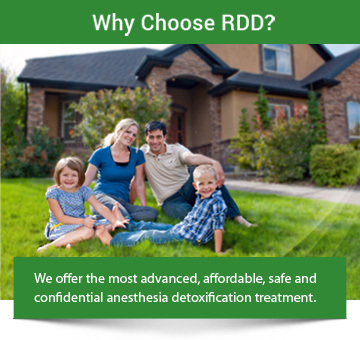 Contact Rapid Drug Detox by filling out our form or by calling us at 1-888-825-1020. Our nurses are on call 24 hours a day, 7 days a week. The RDD Center knowledgeable, licensed medical professionals are available to answer all of your questions. Thank you so much for your help, then and now. We Have Our Son Back! Thank you so much for helping me get my life back. I just wanted you to know that I am doing fine. Everything is going very well. Very tired but feels so good to be done and free. I thank God for my life and I thank God for you and your staff. Moving forward and living life drug free!!! 3 day all-inclusive anesthesia detox. We are proud to offer our all-inclusive drug detoxification procedure at affordable rates. More. Your confidentiality is our priority as you overcome your drug addiction. Learn More.